CBOT markets along with cotton are green across the board as we cover new shorts ahead of a big couple of days. This afternoon we will see crop condition updates, while on Thursday we will get the first look at yield data from the WASDE report. I think today’s report could be as if not more important for the trading week as it should set the tone for what expectations should be on Thursday. Conditions are still a relative mystery given the shift in weather conditions (mainly temperatures) over the last week. It is really weird to see the weather conditions on extremes like this. Normally hot and dry or cool and wet is the theme, cool and dry at this time of the year is an anomaly and I am not sure how the USDA is going to peg ratings today, especially in soybeans. The next 10 days are not showing a large deviation from the trend. Temperatures are expected to stay well below normal over the next week, with a warm up shown at the end of next week. The lack of heat could be a problem. I am not an agronomist but I did grow up staring at rows of corn and soybeans. Things look pretty good, but I do not see things like I did a year ago, especially in soybeans. The crops seem smaller and not nearly as over grown as a year ago. Driving on i-88, you would see many fields where the 30 inch rows were not closed yet by the plant. The weather going forward does not inspire much confidence the crops are going to finish well. 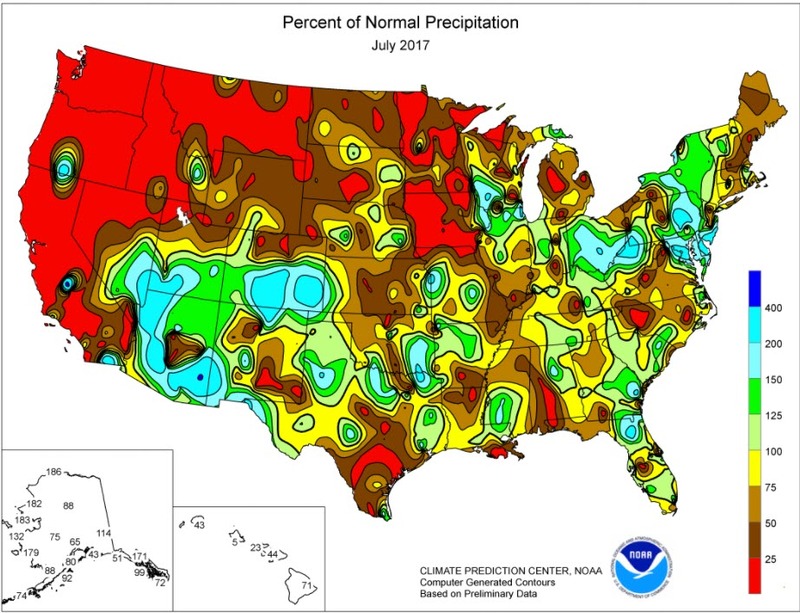 Here is a look at the 5 day precipitation outlook and the July precipitation % of normal. Trading this week in corn and soybeans is likely to get wild. The COT reports show the funds remained long positions into last Thursday. I expect funds are set up the same way right now as they were a week ago. 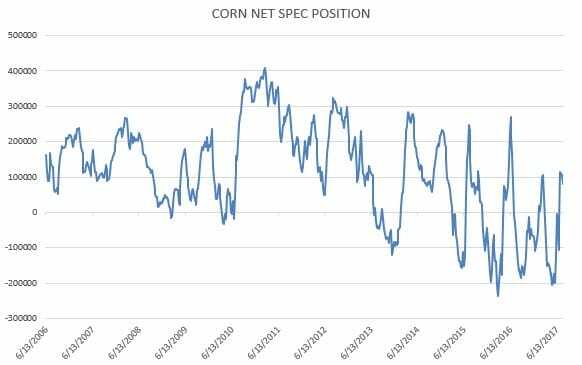 The COT set up should encourage folks to look at put options in corn ahead of Thursday. If the USDA does not confirm a yield in the mid-160’s like many expect, there is a lot of fuel for this market to burn lower. As I have mentioned before, August is a time for setting lows in corn, but in the bigger supply years for the past (06,07,09,15,16) lows were posted in the back end of August. I like the confidence the funds are showing right now and I think it reflects the conditions appropriately, but folks who are undersold should look at cheap puts (Sep 380 SD put for 4 cents) as a way to get in front of a surprise. The funds are not as relatively long soybeans right now as they are corn and wheat. 960 was a level that gave bulls trouble on the way higher back in the winter/spring, it should provide some support as it is doing this morning. I expect tonight’s report in soybeans to be traded heavily ahead of the USDA on Thursday. The Monthly International Trade Report reflected June bean exports 7 million higher than was reported a month ago. June bean exports from the US were the largest since 1983 and almost double of what they were a year ago. US corn exports came in 50 million lower than a year ago but above 15 and 16. USDA corn export pace for corn and soybeans should be met or even exceeded in the case of soybeans. 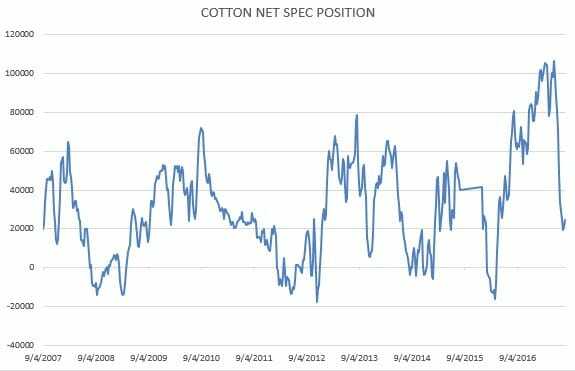 We know the story for cotton\, exports have been on fire. We are currently at 108% of expectations for current exports. There is good news in wheat as well, with exports coming in near 113 million bushels vs 88 million a year ago. This year’s June total was the highest since 1987. US wheat is now the cheapest in the world, I expect this to continue. 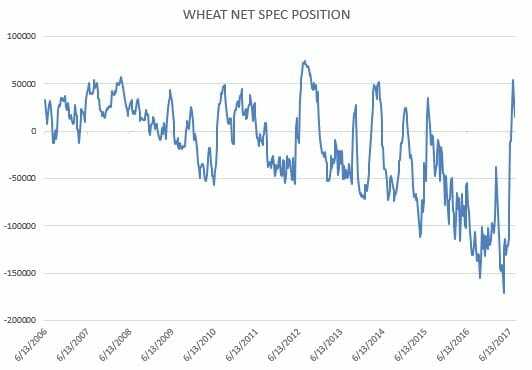 COT reports for wheat scare me a little but I think with world cash markets set to rise post harvest, I would advise buying wheat at these levels. US golf wheat is the cheapest in the world and Russian prices have not come down after news of very good production this year. Seasonally, wheat prices tend to bottom at this time of the year. We know the story for spring wheat in the US, Canada faces similar problems on short acres. Australia remains dry and should get dryer. A year ago lows in wheat were formed in late Aug, I expect the similar to happen again. Stay long if you are still in the fight. COT shows the board is susceptible to selling but I think commercially things should hold in given the problems globally. Lastly, cotton….70.90 is the 50% retracement of the May/June selloff. That was almost the high last night. A break of that level probably sees a test of the high 71’s. 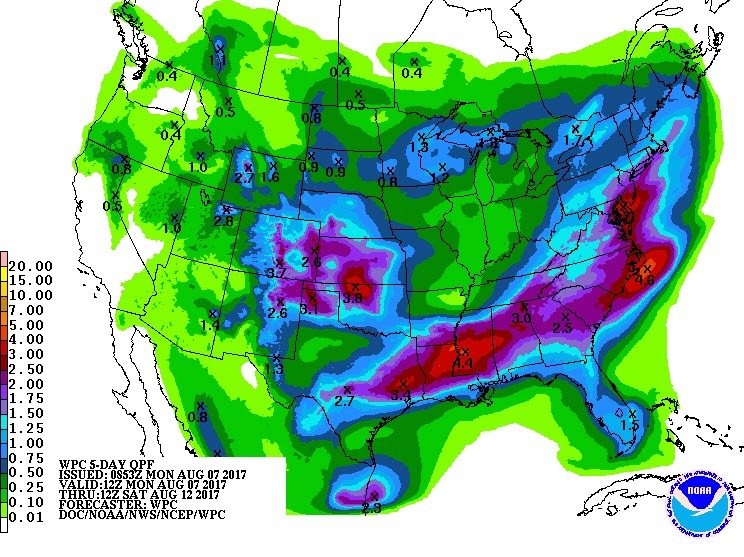 Markets will be keeping an eye on Texas conditions tonight after a week of rain, around Lubbock. According to MRCI.com , the 5 year seasonals show promise in mid August, but longer term seasonals would encourage selling. 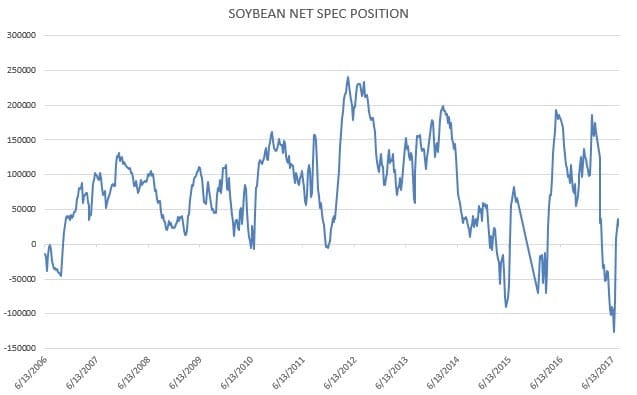 COT reports show funds in a long position but its much, much less long than in the late Spring. Indian crops should be better this year, as will Chinese and Pakistani crops. There seems to be enough rain out there to show crop conditions at worst sideways. WASDE on Thursday will probably be friendly old crop (great exports) and bearish new crop (acres, yields). I would be selling any and all rallies into the 72 cent area. Really short term traders might want to take a shot shorting this morning with a tight stop above 71. Have a great week. I was on Market Rally with Chip Flory on Friday, if anyone cares to take a listen you can do so here. Thanks to Chip and the crew for having me, it was fantastic as always. They will be embarking on a crop tour starting on the 21st of Aug. I look forward to following on this newsletter.